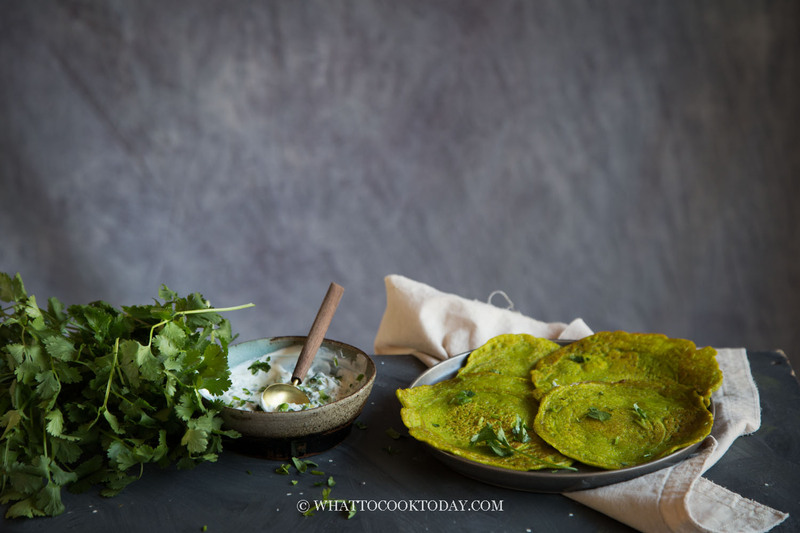 Savory Moong Dal Pancakes and Simple Yogurt Sauce – Learn how to make this simple yet amazingly delicious Indian savory moong dal pancakes that are perfect as a breakfast dish or as an accompaniment to other meals. Okay, so here’s a little background of Indian food and me. I never knew about Indian food until I lived in Singapore for few years. Growing up, I had no exposure to Indian food. There is a very tiny Indian community in the hometown where I grew up, but still, you don’t find much Indian food being sold there. Indian food is well-known for heavy spices, which I love. Indonesian food has lots of spices and herbs too, but they are almost a different set of spices and herbs being used. I love Indian food now after Singapore! I felt like I had been missing out all these years, but again, I had no exposure to it. I only grew up with Indonesian and Indonesian Chinese food. With the recent trend of Indian food, it’s even easier to find food Indian restaurants. We have a couple of our favorites here in Minnesota too. 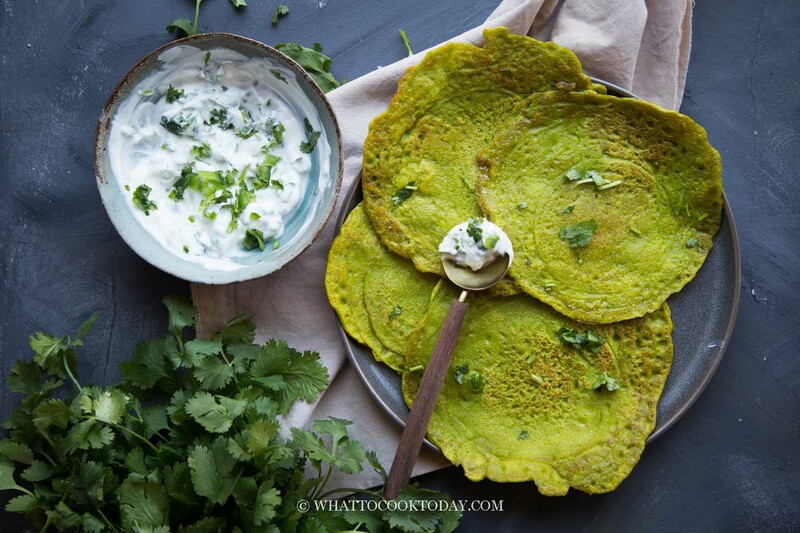 Anyway, let’s talk savory moong dal pancakes, shall we? Moong dal is also known as mung beans. These tiny green color beans are widely used across Asia, Europe, Middle East, anywhere but the United States 🙂 until of course recently! There is also a variety called split mung beans, where the outer shells have been removed to expose the yellow flesh. This recipe calls for split mung beans. Here are several recipes that use split mung beans in sweet and savory dishes. IS MOONG DAL GOOD FOR YOU? Moong dal is packed with protein, carbohydrates, and fiber. They are great for those who are vegetarian, vegan, or simply just want to have meatless meals some days. They are a cheap source of protein and easy to grow and that’s why they are highly popular. Moon dal is naturally gluten-free too. So yes, moong dal is definitely good for you, but it’s not a magic food that you can overload on its own too. Everything in moderation and variety is important too. Soaking will soften the beans and also helps to remove some of the indigestible carbs, oligosaccharides, that causes bloatness/flatulence. 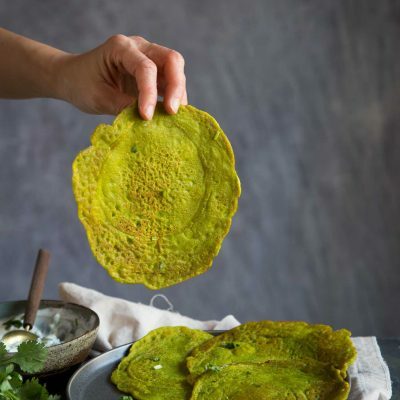 WHAT CAN I SERVE MOONG DAL PANCAKES WITH? 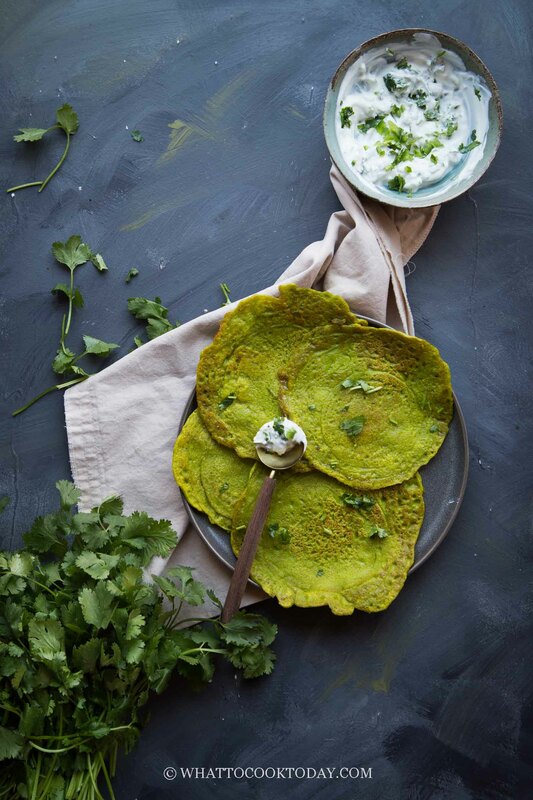 These savory moong dal pancakes can be served as is with the simple yogurt sauce on. You can replace tortilla wrap and used this protein-packed wrap instead. You can also serve it with other vegetable side dishes, curry dishes. These are just to mention a few. 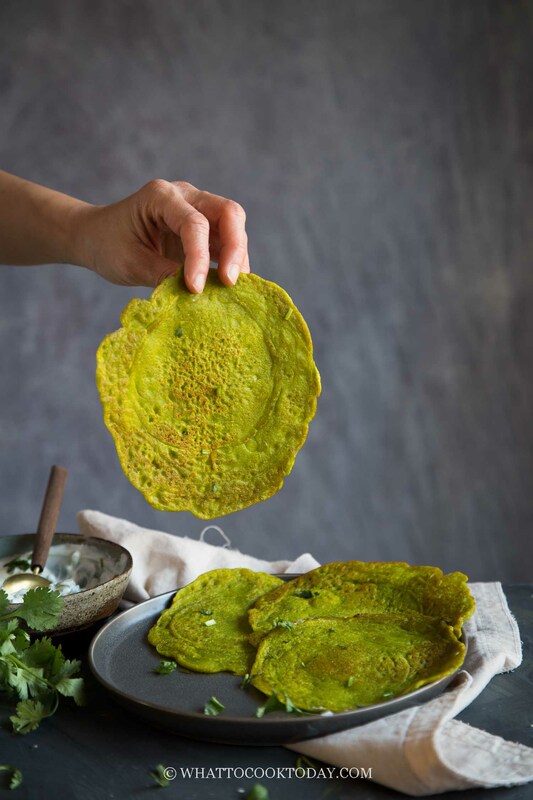 This savory moong dal pancake has become my husband’s favorite. Even the kids love this pancakes. Don’t be alarmed by the greenish color of the pancakes. That is naturally from the cilantro leaves that I blended together with the moong beans to make the batter. The recipe is adapted from Madhur Jaffrey’s Vegetarian India cookbook, which I totally enjoy cooking from! 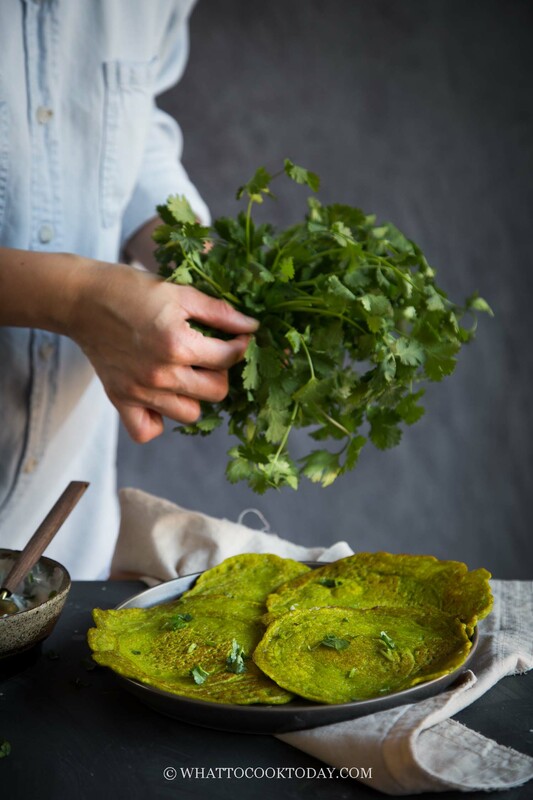 Learn how to make this simple yet amazingly delicious Indian savory moong dal pancakes that are perfect as a breakfast dish or as an accompaniment to other meals.